On June 27, Salesforce.org and Keith Heller presented the second installment of our CRM Options for Enterprise Nonprofits webinar series, showing the features and benefits of Salesforce.org’s Nonprofit Success Pack. This series is designed to help organizations learn more about today’s CRM solution marketplace. We also hope to help organizations understand and overcome common obstacles preventing them from adopting new technology. Keith Heller: Good morning everybody. This is Keith Heller. I want to welcome you to our webinar today in the series CRM Options for Enterprise Nonprofits. Today we’re going to be joined by our colleagues at the Salesforce.org. They’re going to be talking about the Nonprofit Success Pack. This webinar is one in a series. It’s the second one. Our first one last month was an overview of CRM options and how you go about selecting software, thinking about that. I really encourage you to look at that webinar and it’s available on our website, and the links are easy to find. Today, as I noted, Salesforce.org is here to talk to us about the Nonprofit Success Pack and over the next several months we will be joined additional vendors, Blackbaud, NGO Connect, roundCorner, Clearview, StratusLIVE and ROI Solutions. We certainly hope that this will provide you with a good view of what’s available in the marketplace for enterprise nonprofits when you go to look for a new CRM or fundraising system. I’m going to just note a few things before we turn it over to our colleagues today. Just a reminder of Heller’s Skills and Services, we help with CRM strategy and design, much like an architect helps with the building of a house. Then we actually build it with our CRM implementation services, moving people onto their chosen solutions. We try to do that of course with a boost bringing into bear our technical skills, our business process skills and also strategy and tying it out to the strategies of your organization. Finally, we do a tremendous amount around fundraising and engagement in both the offline and online spaces. We’ve been doing this work for 20 years and we really understand that context. Just a few framing comments and these are called from that first webinar, but things that I wanted to highlight again and I think are particularly relevant to our guests today and their offering. First is, market trends. Overall many nonprofits, and if we were in a big room I’d ask you to raise your hands, but that’s just a little awkward on the phone… Many nonprofits are out looking for new solutions and the solutions that they’re on are 10 years or older. At that point those solutions are really starting to probably break down for the organization. If they’re not actually breaking down they’re confining, constraining what kinds of strategies you can act on. Simply because of the way that technology changes over time. A parallel I like to use is, now think about if you had to use a cellphone that was 10 years old. It’s to remember what kind of phone I had at that time. I might have had a blackberry, but I probably had a flip phone. I thought it was cool, but I couldn’t do what I do now. Live the life that I live, run the business that I do if I was on that older technology. Similarly, that can be true of nonprofits on their older fundraising CRM solutions. The good news is that in those intervening years there’s been amazing advances in technology that are really, truly, genuinely helpful to nonprofits and how you run your organization. A lot of that advancement is coming in the commercial space and what’s nice for us in nonprofit is that working with the right vendors we can see the advances in the commercial space coming to us in the nonprofit space at a more rapid clip. All that R&D money that vendors spend on improving their technologies and then the money that their customers on the commercial side spend to improve that product, those benefits can come through to us in the nonprofit side in a way that was not true a decade ago. We’ve also seen the emergence of what we call “True CRM Platform” and I’ll be talking about what a CRM is in just a moment here. Powerful business intelligence and analytics and these are reporting tools that go well beyond what you might think of as traditional reporting such as Crystal Reports. These tools can tie into multiple systems, bring that data together without the use of… without writing complicated integrations and display that information in a way that is far more intuitive through dashboard and maps and such, so that it becomes much more actionable than your standard traditional reporting. Finally, this point… moving along in the adoption curve, what I’ve just said has been true for several years, the availability of these technologies and such. However, it took a greater effort to make those technologies work for any one individual nonprofit. What we’ve seen over the last several years is a real movement of larger and larger number of nonprofits adopting these technologies, making them work for nonprofit institutions. So that as you here today are looking at your options, you can be confident that you are not on the bleeding edge of things. There will be areas, we’re on the cutting edge, and that can be strategically very beneficial to you; but you won’t be the first ones out there adopting some of these new technologies. You’ll have peers who will… already kind of laid some of the groundwork for what you are thinking of doing. Overall takeaway… it’s a really great time to be out choosing that new technology. Whether or not it was a strategic decision to be choosing software in 2017 rather than 2012, let’s just call it strategic and pat yourselves on the back for that. Way to go. A little bit… platform versus the fundraising system, because you’re going to hear these words a lot. A fundamentally focused in that bottom left circle, how do we nurture our prospects and donors, and how do we nurture our constituents simply from the perspective of them being prospects and donors. When you look at a platform, the platform can hold information and help you carry out your business outside of that sphere. You can extend into mission and mission delivery, and client services and such; or you can extend into greater engagement whether that engagement is traditional offline channels, online, social, communities and all of these pieces can operate within a single environment, which has a great benefit technically and from business process efficiency. The most important piece is it allows you to interact with your constituent in the holistic way that they interact with you because most… for many organizations, their prospects aren’t simply prospects. They’re also, might be, beneficiaries of a mission. They might be volunteers supporting the mission. They might be activists carrying out advocacy. They might be social media supporters and such. A platform can give you a view into that constituent in a holistic way that allows you to relate to them in the fullness of how they relate to you, which increases their sense of the positive relationship that you’re nurturing with them. That’s a little bit on platform versus fundraising system. Finally, when you go to look at these systems, what’s important we think is to develop what we call a CRM vision. CRM vision is the big picture, why are we changing technologies or why are we putting ourselves through this, which is something you’ll ask the middle of the implementation “Why are we doing this?” CRM vision, you craft at the beginning to help you get the big picture. Fundamentally, how is our organization going to better serve our constituents because we do this, go through this initiative? We’re going to deliver more of our mission; we’re going to deliver it more broadly to wider slots of people, more efficiently. We’re going to raise more funds for it. We’re going to increase support in our marketing through a volunteer first for advocacy and all of the agreement is to stand our mission. Sitting down and really articulating what that CRM vision is, is part of change management, part of driving the organization to really get onboard with this. You see here the key questions that you want to be able to answer as part of that CRM vision process. We have a few resources that can help you about that. We have other webinars. We have papers and things. Here you see the slide. We’ll be distributing the slides later with the links and we really encourage you to take a look at those and start to work on your CRM vision so you can really get the most out of the products and platforms that you adopt. With that I want to turn things over to our colleagues at Salesforce.org. Thank you for being here to show us what your offering is. Someone wants to take away control from me. There we go. Andrea Schiller: Great. Thanks so much Keith for the opportunity to present and thanks so much everyone on the line for joining us today. We are very excited to present to you all on the Nonprofit Success Pack. Before we get started, please be aware of our forward-looking statements at… if you can’t read it here you could find it on our website, but they state that “Salesforce.org is widely recognized as an innovative organization and we may make some forward-looking statements during this presentation.” Please remember to make any purchasing decisions based on currently available technology. Again hello, my name is Andrea Schiller and I’m a product marketing manager here at Salesforce.org. I am joined by Dario Mallerman, a senior solution engineer who is going to be doing a really fantastic demo of NPSP for you today. There’s a quick snapshot of what we’re going to go over for the next 45 minutes or so. We’ll begin with a brief introduction of Salesforce.org and describe the three pillars that make Salesforce.org so unique. Then we’ll dive into what the Nonprofit Success Pack is and Dario will make that come alive with a really great demo. Then from there we’ll discuss the amazing community we have around NPSP and highlight what organizations should use NPSP. Then we’ll have some time available for questions at the end. I want to start with a brief overview of Salesforce.org. If you’re not familiar with Salesforce.org, we’re the social impact arm of Salesforce.com where we develop products specific to nonprofits and higher education institutions. We consider ourselves a global force for good, with the mission of empowering our trailblazers to accelerate impact in their community in a whole new way. We do this in three ways; through our technology, through our strategic grants and through our community engagement. What we’re focused on today is the technology pillar of Salesforce.org. We deliver the world’s best nonprofit in educational technology solutions at affordable rates, so that organizations such as the National Aquarium and other nonprofits like yours online can have access to the same cutting-edge technology that Fortune-500 companies do. What a lot of people don’t know is that when a nonprofit purchases Salesforce technology, we reinvest these funds into a community through our strategic grants. We’re influencing the community more than just providing our technology. Of course, none of this is done in a silo and community engagement is a key component as well. This goes beyond Salesforce employees to include our partners, customers, grantees, fellow companies and online community as well. We believe that we are stronger together than we would be alone. Our goal is to really mobilize our network to give back in the ways that make sense for them; through volunteering, donating, consulting, advising and more. Today we donate over two million hours overall as an organization, which we’re really excited about. When building our Salesforce platform we worked really collaboratively with the nonprofit community for many, many years and we’ve really benefited from nonprofits being vocal about the challenges that they’re facing when they’re delivering programs, or when they’re trying to raise more funds or when they’re trying to engage with their constituents. As a result, we have technology solutions that meet these nonprofit needs. At the base of all of these solution areas is what Salesforce.org’s vision for nonprofits of all sizes is. What we call this at Salesforce.org is The Connected Nonprofit, and this is really the platform that Keith was talking about earlier; and because of the demand placed on nonprofits today to perform like never before to deliver programs, to report out on the impacts an organization is making and to talk to constituents on channels that make sense to them, nonprofits no longer need just a solution for their fundraising or just marketing solution that offers one way to do a certain thing. What the The Connected Nonprofit platform provides is an integrated system that covers every aspect of your organization’s operations, which means that all of your data is connected. The fundraising department can talk to the programs department and share real impact numbers with key stakeholders. Marketing can leverage the fundraising data to deliver constituents targeted personalized messages that really resonate with them and drive them to action. The value of all of this is that you can gain a 360-degree view of your entire organization in one place. Today we’re going to be highlighting the Nonprofit Success Pack or NPSP as we call it, which really is the foundation for connecting nonprofit overall. Before we jump into an NPSP overview, we’re excited to share that our vision is paying off for tens of thousands of nonprofits that are using Salesforce today. Here’s what they’re telling us. They’re saying that they’re seeing real results across fundraising and engagements in IT and ultimately impact. This stat isn’t here, but 89 percent of our customers say that Salesforce has allowed them to better achieve their mission, which we think is extremely important. All of these stats are important because they really represented the challenges that nonprofits are facing. With great technology nonprofits no longer have to face these technologies… they no longer have to face these challenges. The Nonprofit Success Pack is at the foundation to help all nonprofit achieve these goals. 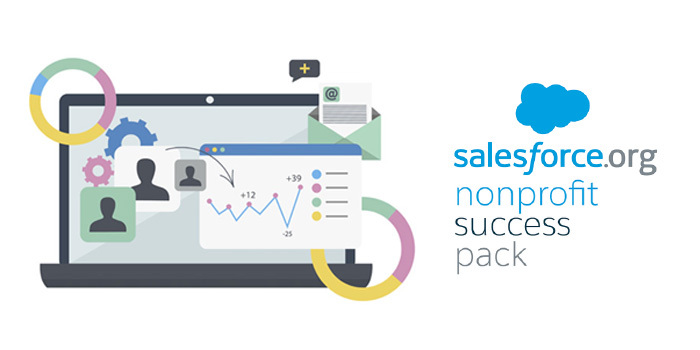 What the Nonprofit Success Pack does is it takes the world’s number one CRM and turns it into the number one CRM for nonprofits by building on top of the great Salesforce.com platform and making it really usable and fantastic for nonprofits of all sizes. NPSP provides three fundamental values that we like to highlight. First we’ve created an industry standard architecture that configures Salesforce out of the box for nonprofits, which means that you can get started a lot faster. As mentioned, NPSP is built on the Salesforce platform, which means that you can grow and scale easily thanks to the incredible flexibility of the platform and the robust ecosystem of us and partners that can help you implement your nonprofit vision. You’re really part of a really fantastic great ecosystem that can help you achieve all of your goals. Second, we offer strong constituent and donor management capabilities. With all of your organization data in one place, you’re really going to have a really great insight into all of your constituents, and again gaining that 360-degree view of your organization. You’re able to have this view from anywhere at any time thanks to our fantastic mobile capabilities that are offered through Salesforce as well. We also simplify reporting, which is a huge pain point for organizations. NPSP allows you to pull reports without the help of IT and we provide over 70 reports and dashboards out of the box for fundraising and programs to make reporting easier than ever before. The last value and pillar that’s actually my favorite part around NPSP is the Global Community Power Movement behind this product and includes partners like Heller, experts and customers that are sharing best practices with each other and helping to ensure that we meet all of the needs of nonprofits. Some of the great things that we’ll be highlighting… Nonprofits. Yeah. We’re going to also talk about the App Exchange. The App Exchange is an app marketplace of third party apps that allow you to extend your capabilities and functions for NPSP. Dozens are created specifically for non-profits. If we don’t have a feature that you need to help you achieve your mission, you’re more than likely to find it on the App Exchange as well. A quick overview of some of the things we’ll be highlighting during the demo, again the data architecture, complex constituent management capabilities, donation management, long-term management and really fantastic reports and mobile capabilities. With that, I’m going to pass it over to Dario to give you a demo of NPSP so you can see it yourself. NOTE: Please view the recording to understand the specific visuals the presenter is describing. Dario Mallerman: Not a problem. Yeah. Great, let me just… you can see my screen now. Andrea Schiller: Yeah, we can. Dario Mallerman: Fantastic. Thank you so much Andrea and thanks everybody for attending this webinar. My name is Dario Mallerman. I’ve been with Salesforce for over three years. I’m super-excited on these past three years that passed superfast, and I’m so excited to get to show you the latest of the NPSP package and the things that you’ll hopefully be able to do, utilizing the best of two worlds. That is, Salesforce and NPSP. One thing is… because we are over a hundred people. I just saw that on the Go-to Meetings, so please feel free to ask questions in the chat within the Go-to Meeting. There are folks that are going to be able to answer some of those and then we also have some Q&A at the end so we can answer some of the questions for everybody, so we can also learn from each other. Again, feel free to keep pointing those questions to the Go-to Meeting chat. Let’s get started. One thing you guys seeing right now is the incredible Lightning UI within Salesforce. I’m going to make it a little bit larger so you guys can see a little bit better. There. So you see my home screen. Every time I go to the office, there’s two things that I do. One is when I’m getting my coffee I’m wanting to hear… I’m the main administrator so I can see everything that is happening within my nonprofit. In this case, you guys can see that it’s called STEPS. STEPS is a fake organization that I utilize here for purpose of the demo. It’s not like you’re going to learn new information from STEPS, or you’re learning a new major donor by just looking at this webinar. Here, one thing that is key is NPSP is fully Lightning ready, from the beginning to end. Lightning is one of the latest UI that was launched maybe two years ago, a year and a half ago, for Salesforce to make sure that end-users have better UI to be able to do the daily operations from sales, fundraisings, service related to cases, on and on and on. This allows you again to have a fully Lightning ready product as well. Second, NPSP is also fully mobile-ready. All the things that I do on a daily basis is utilizing my mobile device. Before, again I was saying getting into the office, get my coffee, and I start checking my dashboard reports, even things that I need to do for during my day. As soon as I login, here you see your home screen. This could be customized. Again, again it’s based on your needs. If you are the CEO, you may be able to see a dashboard similar to this one to be able to track how much I need to go in this case for my quarterly performance. I could do something for my annual as well; to be able to see how far I need to go from the mentions on a specific date as well. If you are a volunteer manager or an event manager, you can definitely customize your dashboards as part of your Lightning UI and be able to add the dashboard that really matters to you. Then one thing on the right, we have what we call Assistant and it is something that I love personally, because it’s when Salesforce is starting to become a little bit more intelligent and become… supposed to help you on a daily-daily task and activities. The Assistant, what he does in this case is tell me there is more opportunities I need to follow up. Remember, this is your virtual assistant. Here it tells me there is a donation, that it has 30 days without any activity, that I may want to pull up directly here. I can actually always create new task and be able to follow in this case where households for these major gift as well. You may have one like I have today or you may have a few of these assistance activity that you have to forward, but that’s not to mean that they already passed, the data need to close or some… because they don’t have activities as well. Then at the bottom I can see all my tasks for today. I have schedule at lunch to be able to talk about a scholarship or sponsorship with Rachel, and on and on. These tasks are part of the activity record that I’m going to show you in a little bit, but it’s key for your daily activities. Again on the left I have upcoming events and recent records that I was able to view recently. Remember again, you can customize it at any time and anyway. I’m on my home page… the first thing I usually then do is, is you want to start looking at my dashboards. I’m the main administrator. I’m going to see what’s going on overall with STEPS. STEPS is a nonprofit that do many things to help, in this case, homeless in the US. They’ll be kind of homeless, so they provide case management. They provide cases, but they also will need to raise funds so we can provide a world of services. This case you can see that I have a lot of dashboards that gives me that 360-view of what’s going on with STEPS. I can see myself that I’m actually doing great so far; close to the 1.5 million goal. I want to see the marketing, what are the leads coming from, especially for NPSP. If I utilize some tools like on the Marketing Cloud or Pardot, the incredible connection with the Nonprofit Success Package. Remember the dashboard is just a visualization of your report, your data. The beauty about this is I can always click here and be able to view the data that is behind that incredible dashboard. Remember, you need to have access to this as well. If you have an internet doesn’t have the privacy to be able to access that, you’re not going to be able to view any data or be able to edit the dashboard like we’re doing here. If I want to edit… oops… let me go back, because I don’t have access to this one. You’re certainly able to drag and drop based on the needs that you guys have running that report. I’m able to move certain fields based on the needs that we have here. Let me go back here and in this case we have for example, another… some donations, five plan analysis and again, be able to view the report as well, at any time. Now that I have… I was able to view what’s going on within STEPS; my next step is really going into one of my top individuals. Her name is Rachel, Rachel Morris. Rachel Morris is part of the Rachel and John Morris household and this is key, because this is where we were talking about the architecture within NPSP. NPSP use the household model that allows you to track husbands and wives, partners, boyfriends that live in the same household or any type of relationship that you want to track within that specific account. The beauty of this is all the donation opportunities are going to be listed on the account level even always soft credit. I have a lot of clients and nonprofits and I’m going to show you in a little bit how you can see in this case how Rachel and John are doing overall, or I can always see how Rachel, because she’s my primary contact be able to view that as well. Let me do this. Now, here I can see that Rachel is our primary contact. We have two household members. That she hasn’t given gift this year, but there was a giving is a pledge in there. We have… be able to see a lot of the details about how you want to address in this case, from like formal greetings or informal greetings like the salutations. Being able to manage a lot of the addresses that have within the record of… again, I love these because it’s even like without even writing a report in NPSP, being able to see the first gift, last gift, average gift. Even the best gift year; be able to have just a part of what’s going on, because I want to ask Rachel for a large gift. Before I do this, I just want to make sure that I can see what’s going on in this case. Again, besides having the donation information within NPSP, here is all the donation’s totals to give me again, how many gifts, the number of gifts and any other information that’s going to be relevant to me. For some of you, I know some of you, you guys do membership. You can also have with NPSP be able to manage a lot of that membership information, especially for the arts and cultural museums for organization. We don’t have a lot of nonprofits that also do membership on an annual basis as well; they give you certain benefits, so you can also chart membership information as well. If it is something that you guys don’t do, the beauty of Salesforce is you can always minimize it; you can also remove it from the layout and just not have it as part of your overall layout. On the top this year and this is part of the new Lightning UI is to be able to see all the activities that happen within the record. In this case, all the meetings, phone calls, emails, even the one-to-one activities that you guys directly do there. If you use Gmail or Outlook, we have an incredible integration. Our goal is that you guys don’t enter data, so if you do send an email you realize either one of those doesn’t reach them, you can automatically add those tasks and those emails, on the activity record within that account or contact record. Great information, now I’m going to go more to see… want to see what’s going on really with Rachel. Remember Rachel account. Now we are going to actually see the contact record. Here you see she’s a senior director. We can see… Remember, we already know it becomes part of the Rachel and John household and all other information that is key that I want to see just on the top on my contact record, and again, easy to customize. I have one account owner. We can see that John is a main donor within Salesforce… I’m sorry, within STEPS, but if you do want to also follow up what’s going on within Rachel, I can also… like I do here is follow the record to be able to give me an overall activities, what’s going on in this case with Rachel. One thing about NPSP that I think is incredible… incredible, but this one is with us for our nonprofits is we want to separate the individual relationships against the organizational affiliations. It makes it much easier to really track and able to run reports. You also make them together and be able to run those reports as well within the dashboards that you have; but in this case I’ll be able to see all the relationships. You want to see all the relationships that we have between Rachel. We can see of the household, coworker, any also explanation that you want to add, because sometimes it’s not just as clear or culture as you want it to be. You can actually add a different type of relationship. In this case, we know all these are definitely current relationships within Rachel’s record. Then, as what I was saying before, is be able to see the affiliations that she has. In this case we know she works at JPMorgan Chase Foundation, so this is going to be key especially if you’re going to ask for maybe a grant or a sponsorship. I can always talk to Rachel to be able to help me to facilitate that information directly there. At the bottom, I’ll be able to see all the campaign history that Rachel was part of because of the incredible integration we have with the marketing tools. It can be that maybe she was invited to an event. It could be also she was invited a campaign for direct mail if needed for a specific campaign. Maybe it could be a capital campaign or it could be also any other acquisitions campaign that you guys run on annual basis to be able to bring new records, new prospects, new contacts to your NPSP. Here I can see all your donations that happened, because we soft-credit directly to Rachel. I want to stop here because this is one of the latest features within NPSP. Be able to manage engagement plans, because now I want to ask her for a $5,000-gift. You notice all these steps that I have to do. If I’m going to create a new engagement plan, I can decide what type of engagement plan. They may want to do a major stewardship plan. What does that mean? If I base this plan based on a template, I don’t have to create all those tasks and activities. You guys already have this because… maybe you have it on Excel. Maybe you have it on that little bill book. Maybe you have it on a notepad, written on a wall right in your office. What I mean with that is, you have the tasks and activities created. You know you have to call Rachel. You know you have to send a thank you mail. You know you have to send I think emails; you have to send report with the latest numbers. You know you have to have a dinner with Rachel and maybe your CEO, so while you can have all those tasks and activities automatically added to the record, so then you know how long it took you to be able to get that $5,000 gift within NPSP or Salesforce. Another thing that is a beauty about this engagement plans are not just tied to donations. You can also tie it to activities. You can also tie it to a campaign or you can tie it to any other activity in the account as well and it makes it really important. Get no tie to donations. So let let me show you how one of these engagement plans actually look like. I’m going to edit one of the… and this is one of my templates, because I’m going to be using this I mean not just with Rachel as I said before, but with other new major donors that I want to acquire or major gifts that I want to add to STEPS for this fiscal year. I can see my major gift. I can also talk about when… engagement plans assigns… who should it be assigned to. I want to always say to the person who created the plan, in this case it would be me, I want to skip the weekends and always talk about Mondays when the task is due. You know what I mean? I always want to update the chow task. What I mean with that is, you can have tasks that are dependent on each other. I have Task One here that’s saying congratulation for achieving. In this case make sure we want to call on donors and then we want to share impact report with a donor. All these are dependent on one, each other, because we can’t do a whole donor until we have seen a congratulations email or a letter directly to them. All these again get updated every time that you complete them. To view your board engagement plus the use the task object within Salesforce, because it makes it really easy to see all these activities in the area that I just showed you a few minutes ago within the contact record. Every time that you update that task, you’ll automatically also update your engagement plan. Then you can also have tasks to go at the same time. For example, we know that here we want to be able to invite him to another activity or event. All those can be happening parallel with the specific engagement plan. You can definitely add these engagement plans I would say on the manual basis, but you can also have a more what we call automated way. What I mean is, let’s say that when someone achieves a specific level – then create an engagement plan based on that. Levels is also a new feature within NPSP package that allows you to have different levels. Not just again for fundraising, but you can also have labels… No. Sorry. Levels for volunteers, for those actually do have volunteers actually within the organization. In this case, we have a level called major donor and we know that when someone gives a minimum of a thousand dollars and maximum, I want to leave him blank because there’s not… I want to automatically create a donor plan. All those steps and tasks that I just showed to you imagine they’re automatically created within the contact record. Then being pushed to your major gift officer to start being able to do the stewardship for that record. Fantastic, no? Save a lot of time to be able to do that as well. Going back to Rachel, we can go here. We can also see NPSP also does a lot of fundraising, that’s program management and volunteers, is being able to track volunteers hours within the NPSP package and what shifts and campaigns he actually did. Again, incredible for those folks that manage a lot of volunteers as well, if you want to see a lot of more, again, detailed information, there’s a lot of robust contact prefer email addresses, and again on all the donation information that matter. Included in this case, we have the volunteer information that this is always showing up on the contact record. Rachel can actually sign up on your website, be able to find out, the stuff that you have to do and be able to track these hours and days or campaigns based on the jobs that actually she was assigned or she wanted to work as part of her activity. STEPS, because it does a lot of things helping a woman to hopefully get a job and not become homeless in this case in the US. It does also a little bit of program management as well. What I want to show you is how also NPSP allows you to utilize Salesforce Communities to be able to track a lot of the program management. In this case, think about someone like Rose. Rose is an individual that is looking for services. As soon as she follow a form within that specific community, she can actually have these steps automatically created or an engagement plan based on those questions that were answered. She recently started and then was already assigned. In this case Rose is one of your advocates. It could be a case manager or one of those individuals helping Rose hopefully with some of the issues that she has. You can see that there are already some tasks that were created. She has to submit a job history. There’s survey with skills and there’s a mock interview number one and number two that she has to have as well. She can also here within the community be able to some of the cases that we’re working, because Rose actually lost her place that she was living, so we’re trying to find that long-term housing. She can always go here, be able to see how that case is happening if there is any updated information. She can always close this case or be able to write a comment. If we need a little further information for Rose to help within the communities. I know I’ve been talking about a lot of things, but you can see how NPSP is fully robust and can help you from fundraising, for engagement, be able to work with your volunteers and be able to also work in this case with program management, like in helping STEPS, in this case, or helping a woman find a long-term housing or jobs as well. Andrea, are there any questions? Andrea Schille: Thanks Dario. We don’t have any large ones right now. You can continue going or we can talk about community and have some questions at the end as they come in. Dario Mallerman: There are few things that I… there’re few things that I also want to discuss. I know I mentioned words as well, reports within the NPSP package. It has hundreds of reports that are out of the box within NPSP that you guys can look here and start some of these reports anytime. Then here you’ll be able to see from NPSP fundraising report that we have again hundreds and hundreds of reports that you can start. You can again hopefully edit it at any time you have. You can have access here, be able to add and drop based on your needs according to a department I interact with here within the specific report. If there is reports that are not out of the box like I show you and you can also start your own report from scratch. That’s the beauty of Salesforce. You’re going to be able to have hundreds of hundreds of reports not just from NPSP, but also be able to utilize your Salesforce reports that come out of the box and be able to build from scratch. Great functionality in both ways, back here and last. But not least, I know I showed you… This is one of the questions that I’m being asked here is we already know that you’d be able to track your donations for individuals, so it’s incredible strong that you’ll be able to manage the organizations. As I told you, the household is the type of the architecture within Salesforce, but we also have what we call the organizational record to be able to track in this case any company corporation, government officials, business, anything that you need or want within organization to be able to track within here and the NPSP package. In this case you can see how I can actually see JPMorgan Chase Foundation, be able to track all that information that matters to me from all the donation information and totals similar to the household record, but then it has more unique things like all the matching information that matter, where you guys are looking for those; and the ground-breaking information if this is one organization that’s actually looking to provide grants to you guys and then what type of funding then focuses within here. Be able to actually add focus on a lot of donations in this case as well, at any time. They’ll actually go here and be able to see related and be able to see again my updated contacts donations and maybe start working with the grants. Again, you can see here all the type of donations to be able to manage any type of grant that matters to this organization. I don’t know if this is the only time. I know it’s hard for me really to show you the power of NPSP within 20 minutes, but I hope I was able to really show you how you can really manage your day to day operations utilizing NPSP within Salesforce and especially with the latest Lightning UI that is incredible, amazing. Andrea. Andrea Schiller: Great. Thanks so much Dario. If you want to make me present again, I want to go over some information on how we develop NPSP. Then we have some questions that we will be asking you. We’re having some great questions coming in now. I wanted to again discuss the great community behind NPSP… and what is so great about this community is we’re constantly working with them to develop NPSP throughout the year and throughout the past of your business as well. We develop NPSP through something we call community-driven development. As you can see here, what we do is take the incredible innovation coming from Salesforce.com, including Shield and Lightning and Einstein and we add industry-specific features. Throughout this whole process, we’re communicating with the nonprofit community to ensure that we’re building the features and functionalities that nonprofits actually need and we do this through the Power of Us Hub and getting ideas through there, through working with partners, through the NPSP Advisory Council, through the CIO Advisory Council and through our community sprints where we bring developers, partners and anyone interested in helping develop NPSP for two-day long sessions to do that. We really have some incredible community innovation that we’re doing to continue in developing this product and making sure that we’re working on features that are actually going to be useful for all types of nonprofits. One of the great aspects of our community is something we call the Power of Us Hub. Once you’ve started a Salesforce trial, you’re able to join the hub and the hub is a community of over 29,000 users who are posting over 7,000 posts a month asking questions about NPSP, about functionality, about how to implement. Really just great conversation topics around there. Ninety-nine percent of the questions get answered, so the community is really coming together to ensure that everyone is successful when using Salesforce. We also offer weekly hub office hours and there’re local user groups throughout the world if you’re interested in joining a user group in your area to meet in person. Before we jump into questions, we know what types of organizations that get started with NPSP. Organizations that are looking to gain a 360-degree view of their entire organization, nonprofits that are looking to fundraise, run programs and need to show impact. Again, as mentioned, we offer a really fantastic platform that allows you to view all that information in one place. Again, nonprofits looking to join a really robust and fantastic community that wants to help the nonprofit succeed with technology. With that, we have some time for questions. Dario, are you able to explain the household model that NPSP provides? There is some confusion around what that is and what that looks like. Dario Mallerman: Yeah, not a problem. Yes. As I said before, the household model allows you to track on the account level that has gone the way and all the records and everything happen within there. Then because each household is going to have their own contact like Rachel and John, so then you can also track how each individual is doing. Remember, everything that is happening on the contact it also is going to be able to view it on the household level as well. Then the other part is being able to track the organization records as I show you at the end. Andrea Schiller: Okay, great. Are you able to go over kind of high-level automation that Salesforce and NPSP provide? Dario Mallerman: Yeah, definitely. Here’s where you get it. For engagement plans for example, you’ll be able to automatically create a plan without actually lifting a finger, because you’re going to say that for every account or an individual that raise more than a thousand dollars, please create an engagement plan as well. Or just utilize that for volunteers’ hours. For an individual that volunteers more than a hundred hours per week, please let’s make a phone call from the Director of Development or the Director of the Volunteer Team. You don’t have to only use it for fundraising as well. So this creates a lot of automation. Then you can also use a lot of the automation workflows that happen within Salesforce because it use a lot of the same objects as well. If you want to create something, for example, when a new donation is added, please create a Chatter post. You can do that with a process builder that is part of Salesforce functionality. Andrea Schiller: Okay, great. Thanks Dario. We have a question about matching donations. How robust is the matching logic for matching donations with donors in the system? Can it handle large volumes with accuracy? Anything, information around matching gifts? Dario Mallerman: Yeah, so that’s a yes. It can manage a lot of the accuracy. That is key, and be able to manage all the matching gifts that happen on the contact record and be able to manage also the matching gifts from the organization point of view. You can do both. To be able to key, to be able to apply that matching gift to that specific individual and to that specific record that is key to be able to track from both point of view; from the individual point of view and from the organization point of view. Andrea Schiller: Okay, great. That was great information there. Can you explain Chatter and how a nonprofit would use it? Dario Mallerman: Yeah, fantastic. Chatter is an incredible Salesforce tool that allows you to internally… because it’s a social internal tool for not just business. It’s for… no, I’m sorry. Not just for nonprofit, but a lot of business using within all over the world. It allows you to collaborate and not just collaboration on projects… also you can do that, but specific accounts and records. I always say this is what happens in emails stays in emails. I hope that I’m going to be working with Salesforce for a hundred years, but then let’s say someone else are going to be coming to STEPS, that organization that I was just showing, and wants to see how I raise the money within Rachel. You can see all that information. You can also see all the Chatter posts, all the questions that happen on that team that we were working to get the $5,000 gift and to be able to see how we got there. Be able to post questions on contacts, on accounts or be able to also share information within that report. It becomes really a more interactive way within any nonprofit. Andrea Schiller: Great. Thank you so much Dario. Next question we have, where is the donation information coming from? Do organizations need to have their own database for this? Dario Mallerman: No. The donations could be… are definitely managed within NPSP under the donation records. You can see all the donations history on the account level and on the contact level as well. When we talk about donations, one thing that I didn’t mention is it could be anything from… we talk about a grant, in kind, a major gift, a regular donation, a matching donations that were asked earlier, memberships for those and tributes as well. All those types of donations are going to be tracked on the account level and can be entered coming mainly from your online form on your website. It could be also monthly donors or recurring donors coming from every single month or it could be coming just for checks, coming from direct mail, I may be able to manually enter there or do an import for those maybe more robust solutions like a caging company or things like that. Andrea Schiller: Great, thank you Dario. Getting some more to that, are you able to talk about integrations with other platforms such as other fundraising platforms, or information on overall integrations there? Dario Mallerman: Yeah. The beauty about Salesforce and NPSP is you can actually integrate with other solutions. I’m not sure what solutions you’re asking for, but it all depends. Andrea showed you first in the AppExchange we have a lot of applications that are incredible for NPSP. A lot of folks use, for example, Conga applications to be able to do a merging and documents, but taking that to an incredible next level. I have folks that use DocuSign to be able to automatically have signatures when people really say yes to a specific grant or major gifts, and that could be included within there. There’s dozens of applications. They are approved by Salesforce and if it’s not there you could also create the integrations with import/export APIs. There’re different type of things that we can do utilizing different tools based on the systems that you want to integrate as well. Integration means a lot of things. Do we want to bring the data or we want to just visualize that data from another system within Salesforce? Then we can use different tools. Andrea Schiller: Okay, thank you so much Dario. I have a question about the dashboards. Can the dashboards be customized so that donation… so that the dashboard only shows specific types of gifts? Dario Mallerman: Yes. That’s a yes and yes. You can customize the dashboards based on let’s say only tributes that you want to see or only major gifts. You can do that very, very easily as well. Andrea Schiller: Okay, great. So see what other questions. Are you able to create funds, appeals and campaigns in Salesforce? Dario Mallerman: Yes. Those are time like in one or other system, so we do have a campaign history and then we have what we call a child campaign or a parent campaign, and then be able to manage all those levels that you guys… that you are asking to be able to manage how those are performing on the campaign, or on the fund, or on the appeal. In this case, you can be able to do what we call the parent or the child campaign, and be able to also do packages and allocations for those that do more direct type of campaigns as well. Andrea Schiller: Okay. Thanks Dario. We have a question about event management. Are you able to talk a little bit about that and how you would use the AppExchange to meet that functionality need? Dario Mallerman: Yeah and here’s what we like about the App Exchange. There are a lot of different events apps that it can meet based on your needs. The beauty about this against other solutions is I feel like if you don’t like a specific part, you don’t have to. You can switch certain parts to make sure that fits your mission. Within events we have incredible applications like Classy that advance registration. You can use Click and Pledge, also an incredible application you can use. You could use for larger events as well. Are you looking for more conference or type of larger events, or this is more like one of what you’d call galas or fundraising events. Then we have also those areas within peer-2-peer solutions to be able to raise money and be able to bring that in with Salesforce. Andrea Schiller: Great, thank you. We have a question about pledge processing. Is pledge processing available native in NPSP? Dario Mallerman: Yes. Great question, yes and that’s a yes. You’ll be able to track pledges and it’s a little bit different so we call those in a stage. I’ll be able to track in what stage its donation is and what is the probability, we could just also pledge is just so broad, I mean the beauty about NPSP is we’ll be able to know are we just working indefinitely someone is going to give me the money a hundred percent or we are almost close to that, and working on the eight percent; but he hasn’t said yes yet. So you’re going to be able to use both. Be able to do the prospecting even for a pipeline report so your nonprofit can see when these gifts are going to be coming, then to do the pledge when someone actually comment directly to the gift within the NPSP package. Andrea Schiller: Great. Perfect. Thank you Dario, we have about two minutes left. I wanted to end by asking you to discuss the customization capabilities of NPSP. Are you able to talk about how you can customize it? Dario Mallerman: Yeah and I see an incredible… and this is where the communities become such an incredible place. You can see how folks are really using NPSP in many different ways and take it to incredible ways, because the sky is the limit. NPSP is not utilized in just Germany and US we have a lot of clients in Canada and we have a lot of clients all over the world, including Europe. Also, NPSP, one thing I didn’t mention, is translated in all the different languages. I know Spanish, Hebrew and French is already there, and I know there’s a couple more coming in. We have other countries and they want to utilize NPSP fully translated, it can be done as well. Again, you’re getting the best of two worlds and that doesn’t happen in a lot of different systems. You’re going to get the best of Salesforce, the best of NPSP that we’re adding so many resources every single year and be able to customize that and be able to add your field, be able to track the things that really matter to you, because a shelter is going to be able to track the same thing. That organization like STEP be able to help individuals. You have different items that you want to track and then be able to also track program management all in one place. Keith Heller: Andrea and Dario, I really want to thank you guys for joining us today and showing NPSP. It’s a fantastic offering, I want to thank everyone for joining us on the webinar. The next webinar is on August 8, so please look for that invitation and please do put that on your calendar; same time. We’re going to be sending around links to this webinar so you’ll have access to the webinar and to the slides. Thank you everybody for joining us and we’ll see you next time.